Diablo Lake is one of three visible lakes along State Route 20, the North Cascades Highway. It’s my favorite because of so many outdoor memories canoeing, camping, climbing and even taking classes. 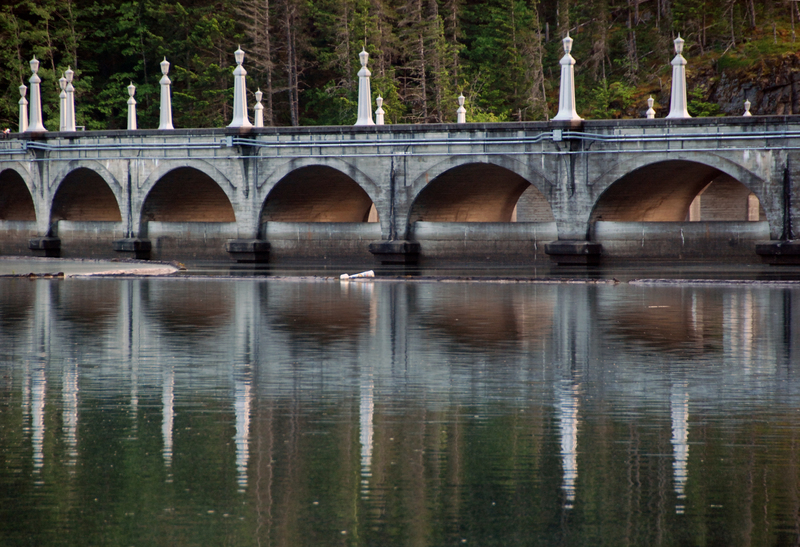 Nearby are Gorge and Ross Lakes which, like Diablo, exist because dams were built in the mid-1900s to provide inexpensive electricity for a growing Seattle. The headwaters of the Skagit River flow from Canadian peaks into Ross Lake then over Ross, Diablo, and Gorge Dams to flow free again as the Skagit Wild and Scenic River System. Diked and directed in Skagit farmland, glacial melt water finally pours into the salty Salish Sea. A remarkable homestead lies below Gorge Lake. 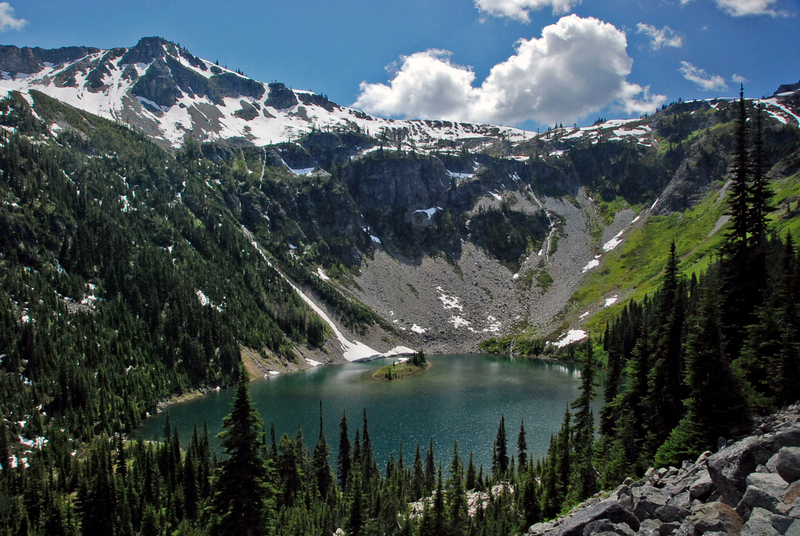 In the 1890s, Lucinda Davis trekked with her three children from Colorado by train, stagecoach, riverboat, dugout canoe, and finally up and over steep miner trails to the upper Skagit wilderness. They built a roadhouse at Cedar Bar, rented rooms and provided fresh milk, vegetables, and pies for miners, trappers, and venturers. She even rented to the men building the new dam–the very dam responsible for forcing her to move out when she was in her seventies. High above the flooded homestead is Lucinda’s namesake, the 7,051 foot tall Davis Peak. 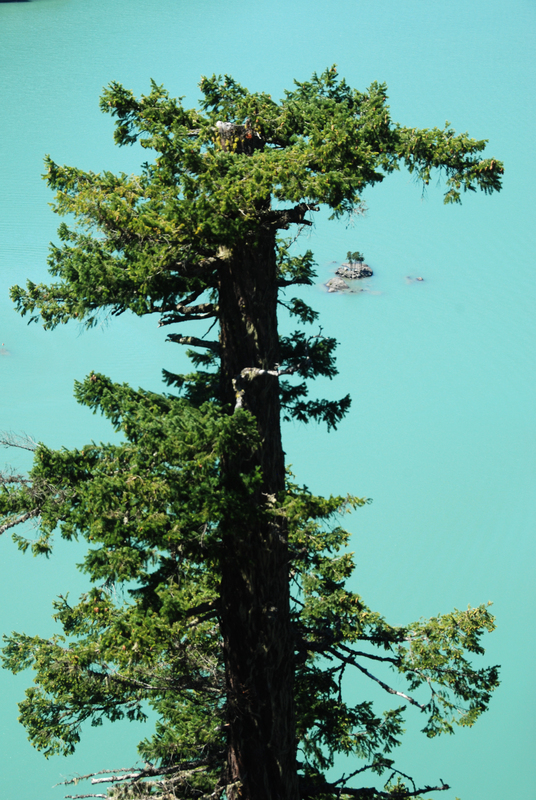 The stunning turquoise hues of Diablo Lake. Behind Diablo Dam is Diablo Lake and the Colonial Creek campground (on the south side at mile 131). A boat launch dips into Colonial Creek, the source of the lake’s aqua colored water. High above, glaciers grind stone into “rock flour” and provide melt water to carry the particles down to Diablo Lake. The fine silt remains suspended in the water. This changes how sunlight is absorbed turning the lake from blue to greenish-blue. The hue changes seasonally based on how much silt is carried into the lake. On the north side of the lake, 5,000 feet below Sourdough Mountain, is the North Cascades Institute. NCI provides seminars, retreats, and programs for all ages on natural and cultural history, art, science, and literature. Access is across the curved art-deco Diablo Dam. Park and walk back for an exhilarating look down into the narrow canyon below. Art deco features on the Diablo Dam. At mile 132, the Diablo Lake overlook provides expansive views across to the dam and Colonial, Pyramid, Davis, and Sourdough Peaks. 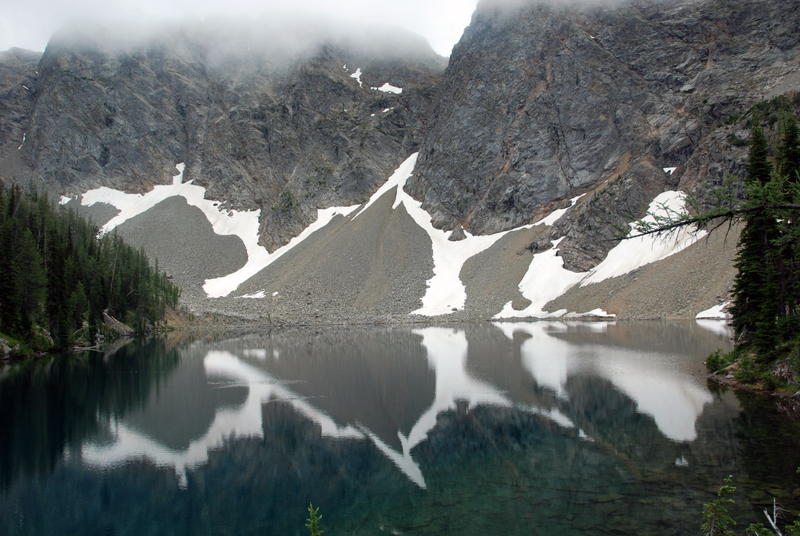 At mile135, small pullouts provide northerly views up the 23-mile-long Ross Lake. Below the road is the confluence of the Skagit River and Ruby Creek, former site of Ruby City. An 1880s gold rush brought thousands of prospectors to the area but the bust came as quickly as the boom because there wasn’t much gold to be had. Many curvy miles east of Ross Lake are Rainy and Washington Passes (mile posts 160 & 162). Unseen from the road, nearby lakes lie in cirques: cliff-ringed basins scoured out by glaciers. Some of these lakes are accessible to the casual hiker. From the Rainy Pass parking lot, a 0.9-mile paved, wheelchair friendly trail leads to Rainy Lake. Amble past interpretive signs through deep Hemlock and Silver Fir forest. 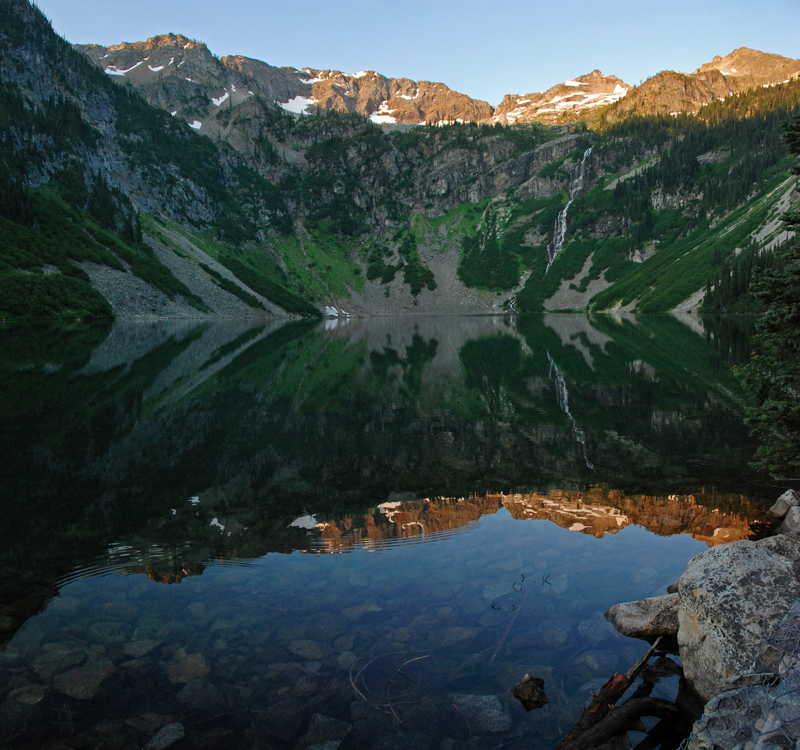 From the same trailhead, hike two miles through forest, talus slopes and wildflower meadows to sparkling Lake Ann. In August, take in the rainbow of lilies, columbine, phlox, lupine, asters, paintbrush and much more. Near Washington Pass, the Blue Lake trail leads 2.2 miles behind the walls of Early Winters Spires to cliffs and October meadows of golden Larch. Snow at the opposite end of the lake always provides Rorschach-like reflections. Rorschach-like reflections at Blue Lake. Jack McLeod in front of Jack Mountain. Photo by Peter Loft. 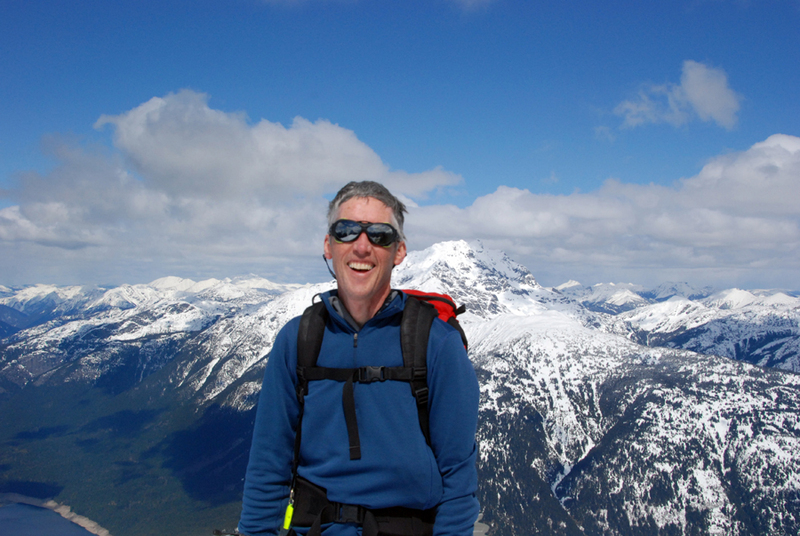 Meet the author: Jack McLeod will be delivering a book talk and slide show sponsored by the Methow Conservancy at Sun Mountain Lodge, August 5 at 7:00 p.m.